Puerto Rico to install 200 pokie machines in major airport. Posted on September 20, 2016 at 10:08 am. The US island territory of Puerto Rico has been stuck in an economic slump for the past decade, and now the Caribbean state has unveiled a creative and highly controversial plan to boost the economy. On Friday, tourism officials announced the Puerto Rico government plans to install 200 pokie machines in the island’s major international airport. The introduction of pokies to the airport is a desperate attempt to boost revenue and rescue the island from its dire economic crisis. The project will cost around US$125,000, with the controversial move estimated to bring in around AUD $2.4 million a year, while creating 23 much needed jobs. It’s a controversial move, as Puerto Rico’s casino industry has been struggling under the island’s failing economy, with many land based casinos having to close their doors amidst the crippling economic crisis. In early 2016, the Intercontinental San Juan Resort & Casino became the ninth casino in just five years to succumb to the pressure of the failing economy, closing its doors despite a $22 million upgrade just two years earlier. The closure of these casinos has led to the loss of hundreds of jobs, leaving many unemployed, while also adding pressure to the struggling tourism industry. The economy isn’t the only thing to blame for the flailing casino industry, as Puerto Rico’s casinos are also being challenged by a flood of illegal pokie machines operating outside the walls of land based casinos. The government’s plan to install pokies outside of licensed hotel and casino venues, as in the airport project, leaves further competition for the already crippled casino industry. 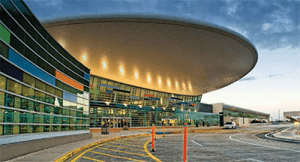 The first 120 of the 200 pokies have already been installed in Terminals A and B at the San Juan Luis Munoz Marin International Airport, with the remaining 80 machines to be installed in Terminals A and C in October this year. The project hopes to help the economy during this trying time, as Puerto Rico seeks to restructure close to $70 billion USD in public debt, an amount the governor has admitted is unpayable. The economy is also crippled by a government deficit of US $2.5 billion. If the addition of the pokies at the airport is successful in boosting Puerto Rico’s economy, it will be interesting to see if any other country adopts this plan. While Australians and visitors Down Under love the pokies, they remain a highly controversial topic in our country, and it’s highly unlikely we would ever see the pokies at Melbourne’s Tullamarine or Sydney’s Kingsford Smith. The pokies are recently back on the national agenda, as anti-pokies renegades Nick Xenophon and Andew Wilkie call for a reform. Stay tuned to OnlinePokieGame.com for all the latest in pokies news around the country and the globe. Bookmark our page to keep up to date with the latest online casino promotions and bonus offers.